There are only three measurements needed for stock boots: the rider's regular shoe size, the calf width, and the height. The 'control height' shown on the diagram is from the back of the knee to the floor when the rider stands in stocking feet. Most boot measurement charts indicate the height of the boot to the top of the outside of the boot, which may be considerably higher than the control height, but if we are helping you select boots it is the control height which is most helpful. New boots will feel 'extra-tall' at first, as they will drop a little lower as they are broken-in; how much will depend on the style of boots (field or dress), whether they have zippers, and the stiffness of the leather. Measuring for custom boots can be tricky, even for someone who does it all the time, but it can be done if you follow instructions carefully. When ordering from Konig, we measure over riding breeches and the socks you usually wear with your boots, and the foot measurements are taken with weight on the foot - but other manufacturers may have different requirements in order to get the right fit. 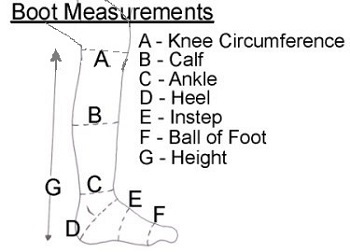 It is generally safest to measure in centimeters to the nearest 1/2 centimeter (always rounding up) and the tape measure should be flat against the largest part of the leg or foot part, but not tight - you should be able to rotate it smoothly and slide it gently up and down the leg when taking the calf measurement. Take measurements of both legs and feet, and don't forget to include your regular Canadian shoe size. Keep in mind that if the boots are too large or too tall, they can be altered; but if they are too tight or too short there is not a lot that can be done. Rubber or PVC boots are simply cleaned using water. Using a soft brush, remove any dried mud or dirt, then wipe clean with a sponge or cloth. To produce a shine, you can use a product produced for cleaning tires or automotive parts, but do not apply to the inside part of the leg which rests against the saddle or horse or the boots may be extremely slippery. Muddy or wet boots should be allowed to dry away from direct heat with boot trees inserted. Remove dried dirt and sweat with a damp cloth and a soft brush where the foot meets the sole, and brush dirt off the zipper if there is one. If there is sweat or grease remaining, clean the boots with leather soap (avoiding the zippers) and wipe it off with a slightly damp cloth. After the boots have dried, you can apply a good boot polish to the feet and outside of the legs and buff to a shine using a soft brush or dry cloth. An occasional light application of a conditioning cream or leather waterproofing product can help prevent the leather from drying out and cracking. A few drops of oil or WD-40 on the zippers will help keep them running smoothly. Always store leather boots with boot trees inside. Sophie (Half-Chaps):"Nice fit, looks pretty sleek." Sara (Full Chaps):"Nice look. Like the extra height." Sophie:"Like the fit of the calf. A tad bulky in the ankle and tough to get spurs over the zipper." Sara:"Easy to put on and off. 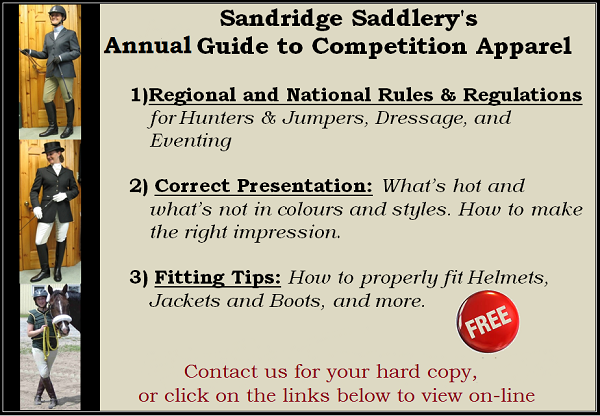 Fit easily over winter breeches and winter paddock boots"
How well did they function? Sophie:"Good feel on my horse, no slip, easy to put on." Sara:"First time on they were slippery against the saddle, but improved with the second wearing. Good traction against saddle and girth. Zippers were amazing! Very comfortable to wear. Good quality leather. Sophie:"Bulk of the ankle, felt less support than tall boots. Would prefer the zip came up to the top." Sophie:"For someone getting into riding I like the fit and durability aspect." Sophie:"In comparison to other equestrian products it's pretty standard pricing." Thank you Sophie and Sara!